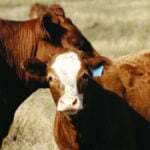 WINNIPEG – Bad weather continued to adversely affect some of Manitoba’s cattle auctions during the early part of the week ended Feb. 8. Strong winds whipped up snow and drove down temperatures, with wind chills sinking into the minus 40 Celsius range. “I’m just looking forward to spring,” quipped Allan Munroe of the Killarney Auction Mart. Regularly scheduled for each Monday, Killarney postponed their Feb. 4 sale to Feb. 7. The delay resulted in 1,120 cattle being sold, said Munroe. Elsewhere in the province, Pipestone Livestock Sales cancelled their Feb. 4 auction, while Gladstone Auction Mart and Grunthal Livestock Auction Mart pressed ahead with their respective sales on Feb. 5, but with reduced numbers of cattle. That Tuesday, Gladstone sold 205 head and Gladstone sold 113 head. There were much better numbers later in the week at Manitoba’s other auctions. Ste. Rose Auction Mart led the way with 1,760 cattle sold at their Feb. 7 auction. Ashern Auction Mart was second with 1,643 cattle sold on Feb. 6. In terms of demand, light cattle were strong, noted Robin Hill of Heartland Livestock Services in Virden. 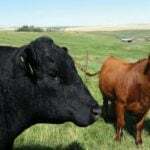 “The grass cattle, under 650 pounds, were good or better than they have been,” he said. At Virden on Feb. 6, feeder steers 500 to 600 pounds fetched C$208 to $233 per hundredweight (cwt). In Killarney those same sized steers brought in C$210 to C$235, and garnered C$200 to C$240 cwt at Ste. Rose. 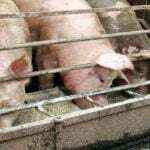 “We’re hoping (the producers) get them fat before the market starts to fall apart on those,” Munroe commented. The heavier cattle were down slightly, according to Hill.